Handmade jewelry is HOT. There's a reason why so many crafty designer types choose to make jewelry, whether to sell, to give to others, or for themselves. So many do it, because people LOVE handmade jewelry. They love to buy it, they love to wear it, and they love to gift it. So many of us are little magpies aren't we? For you inspiration-seeking or specific-information-seeking types, dive in! Use the search function or just start perusing the links. There are hundreds of pages on this website. It's chock full of tutorials, information, tips, and user galleries. ... OR, you're on a recon mission looking for a guide to help you navigate the basics. If you are on that recon' mission and are just kind of feeling out the waters, let's dive in together. Looking for easy places for a beginner to dive in? 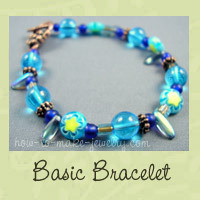 The basic stringing tutorial shows how to make a basic bracelet. 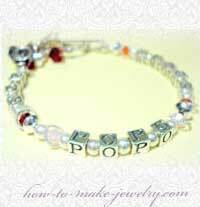 Click the image above to learn how easy it is to make this cute bracelet. Kids, teens and adults alike love the friendship bracelet patterns. Learn the basics of friendship bracelets on the friendship bracelet basics page. Learn how to make hemp jewelry (also known as "macrame jewelry". This is another great one for beginners (and those looking for projects to do with kids). I have a special place in my heart for you beginners because I wish there was someone to guide me when I got started, and I wish that guide could teach me the way I want to teach you -- step by step, with lots of tips to save me time and money and frustration, and lots of pictures or videos to demonstrate the trickier parts. I'm an intermediate to expert type myself so I know the passion you have for learning new techniques and finding easier and better ways to perfect your favorite techniques. And how to make a brushed patina. Enamel is one of the hottest (get it? Hottest? Because your Kiln fire it or use a torch? ) jewelry topics and a personal passion. The ancient art of enamel (the art of fusing glass to metal) is fascinating. It's said it Enameling is easy to learn but takes a lifetime to master. Test that saying out for yourself with some detailed enamel tutorials and projects. Fold forming: Just check this one out. It's so cool. 'Nuff said. I admit, is not my thing. Patience is not my personal virtue. nonetheless, there are some wonderful beadweaving projects by some of my more patient friends on this site. Beading (the stringing of beads i can actually hold without tweezers and a magnifying glass) I can actually do. And if I can, then anyone can. 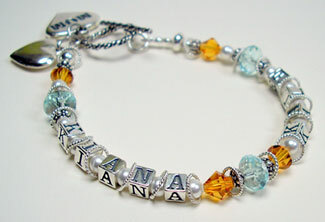 I started making mommy bracelets a few years back. These have proven to be a hit whenever a new baby is due or when mother's day rolls around. These practically sell themselves. I get lots of inquiries every time I wear the one I made for myself. If you want to make a great gift that people will rave about, be sure to check out my free tutorials on these special bracelets. Resin jewelry making is a great mixed media technique. You can make make whole pieces (like bangles) or you can use it to coat more delicate components like paper collages or tiny photographs. Into steampunk? Or just want to know what the heck it is? Take a look at the steampunk jewelry making pages for some inspiration, and to share your work too. For projects and inspiration by fellow How-to-Make-Jewelry.com readers like you, you can't beat my Handmade Jewelry Galleries! You'll find beautiful work in the gallery. A personal favorite type of jewelry is necklaces. I can't get enough of them. Looking at the necklaces and other jewelry visitors are sharing just make me want to make more and more myself! You can see a few of my own earring making projects too if you'd like..
Get jewelry making tips and techniques to learn how to make jewelry more easily, achieve quicker, faster results, and take your jewelry making to the next level. I'm a sucker for tips and tricks that make any project faster, more fun, or more simple to complete. Everyone that makes jewelry has favorite place or two for getting jewelry making supplies. I share my own favorites. I've also started building a directory of materials for easy jewelry tool and supply shopping too. Glass supplies for enamel and lampworking can be found on the enamel supply page. Of course you'll also need tools. If you are a beginner just learning how to make jewelry and wonder which jewelry making tools to use, which ones are best, and even more importantly, which ones are a total waste of money, you can learn more too. "Hey there, Christine - I found you on Twitter (or the other way around; don't remember now *grin*); just wanted to tell you THANKS! You have THE most informative blog! Great writing style, and cool things - particularly like your "how do I get people to find my website" post; I'll be trying that myself in the hopefully not-too-distant future, I've saved it and will be using your tips. Appreciate your hard work - and for sharing it!" For Jewelry Business advice I recommend you check out my other website Handmade Results. It's primarily for jewelry designers that want to sell on the internet so if that's you, you'll love the jewelry marketing advice you'll find there. There is tons more on the site that I haven't yet mentioned. I encourage you to look around, explore the site, and if you like what you see, sign up for my "I'm Making Jewelry in my Jam Jams" newsletter. I highly recommend it for anyone wanting to learn how to make jewelry, or who wants to improve on what you are already doing. It's getting rave reviews so I bet you'll love it. Sign up now and you'll get a free wire work tutorial too. If you've never visited before, start with one of the links on the left side navigation bar or one of the many links within the above paragraphs. This site is structured so that every page can be reached within a maximum of four clicks from the home page so this is your best starting point. If you are looking for a friendship bracelet project, start on the friendship bracelet page on the left side navigation bar. This will bring you to the next page which is an overview of the pages related to that category. You will likely find the link to the page you want somewhere on that secondary page. If not, try the most closely related page and that page may also be an umbrella page that links to a third level of links. The third level is the last level other than any outbound site links. If you have been here before and can't remember where you saw something, try doing a search of the site. Just want to see the most recent changes (within the past few days)? Check out What's New (you can also get to this page from the link on the top horizontal navigation bar too). Love helping out others? Visit the Jewelry Ask and Answer pages to read the posted questions and share your insight. You can of course ask your own questions related to how to make jewelry there too. If you're here for some jewelry supply resources, my bead and jewelry supply resource pages have links to beads, findings, and tools, - and anything else you'll need for making jewelry.